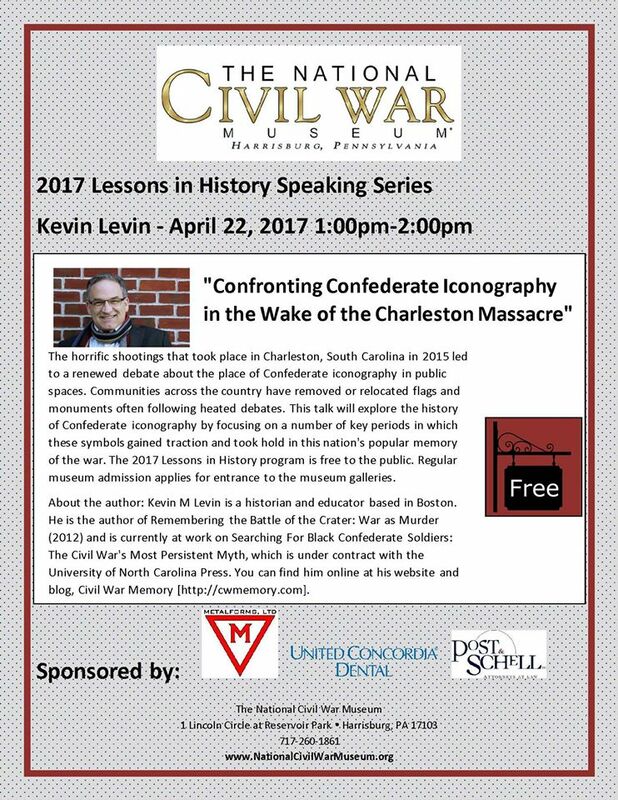 Quick announcement to let people know in the Harrisburg, Pennsylvania area that I will be in town next Saturday to speak at the National Civil War Museum. As you can see below my topic is the ongoing controversy surrounding Confederate monuments. My goal is to talk a little history surrounding specific monuments, but my focus will be on the broader trajectory of Civil War memory to explain why Confederate iconography (especially monuments) remains controversial. I will also talk a bit about how communities might go about addressing specific challenges. The information about the talk can be found on the announcement below. Kevin, did you know there is a monument to Albert G. Jenkins in Mechanicsburg, just across the Susquehanna River from Harrisburg? Will check it out if I have time. Hope to see you next weekend. How about the big monument to Sgt. Kirkland out in front and the controversy about whether or not it acutally occurred. It’s on my short list.